In addition to his other activities, Bernhard Strigel was a noted portraitist. He worked as one of the court painters in the service of the Emperor Maximilian and participated in numerous imperial projects. Strigel also undertook commissions for the aristocracy and patrician classes. This portrait is notable for the realism in the treatment of the anonymous sitter’s features, through which Strigel conveys aspects of his personality, such as the determination evident in the gaze. Colour contrasts are used to differentiate the spatial planes and thus create a greater sense of depth. The soberly dressed sitter is located in the foreground, leaning on a scarcely visible ledge. Striking elements include the two rings with the initials “MS” and “H” and the pendant in the form of an allegory of Abundance represented by a female figure holding a cornucopia. Contrasting with the sitter’s black clothes is the red damask cloth behind him, which also functions to emphasise the blue in the background landscape. The arrangement of the figure, the cloth and the landscape all suggest that this portrait formed a pair with a female one. 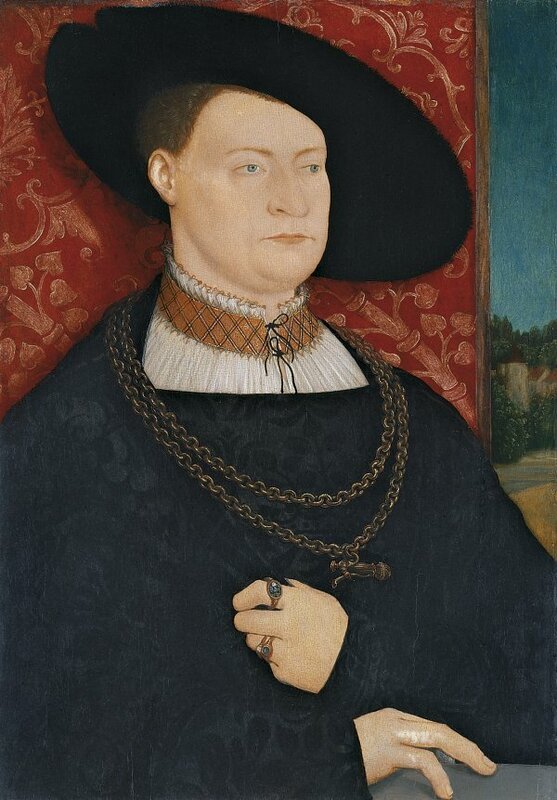 Bernhard Strigel’s portraits constitute one of the most appealing areas within his oeuvre. His services as a portraitist were in demand not just from the wealthy and noble classes but also from the monarchy, and he played an important role in the creation of Maximilian I’s official image. Among these works, of which copies have survived, there is a particularly original group portrait in which the Emperor is depicted in an informal and affectionate manner with family members. 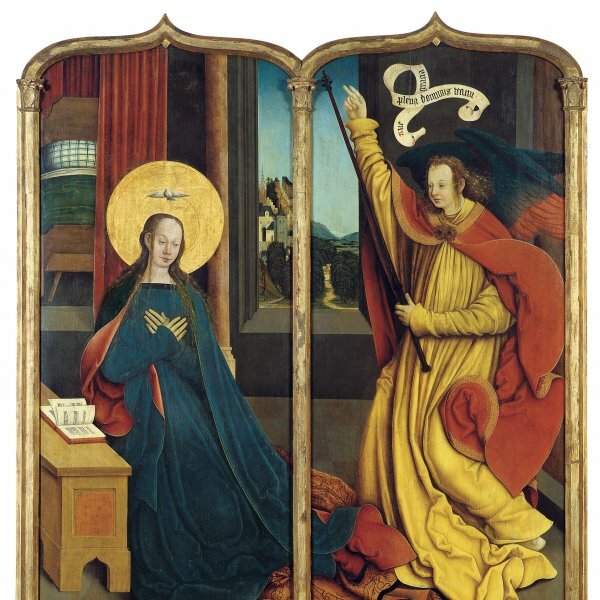 That panel, now in the Kunsthistorisches Museum, Vienna, is dated 1515 and was commissioned from the artist on the occasion of the double wedding of the Emperor’s grandchildren. Strigel translated the format developed in his royal portraits to other types of clients. This is the case with the anonymous sitter in the present panel, positioned in front of a piece of damask cloth with a landscape behind and a small section of ledge in front that defines the spatial context. The artist used strong colour contrasts in this composition, based on the red damask cloth, the blue sky and the extensive black area of the sitter’s clothing, thus emphasising the three different spatial planes in the work. He also established an interplay of lines with the pronounced profile of the hat tipped boldly to one side, the soft, broad curves of the chains on the sitter’s breast and the emphatically straight line of the front of the doublet where the white undershirt begins. This unknown sitter wears a ring on his index finger with a coat-of- arms on which we see a small figure and the initials “ms” and “h”, so far undeciphered. Another possible clue to his identity lies in the pendant hanging from the chain which is an allegory of Abundance in the form of a woman holding a horn of plenty, a detail that has led to the suggestion that the sitter was a wealthy merchant. In addition to his physical features, the artist conveys something of the sitter’s personality through his gaze, which expresses determination and a disciplined character, while the way in which the fingers seem to strike the stone ledge may reflect an impatient, restless character. While it was in the Lippmann collection in Vienna the panel was paired with another female portrait, now lost, dated 1528. That date has been tentatively suggested for this one, which would correspond to the end of Strigel’s career, as he died that year. The position of the sitter and the background do not exclude the possibility that he would have had a female pair. It has been compared with a pair of oils in the Liechtenstein collection dated around 1520 in which a married couple are also depicted against a rich brocade cloth with a landscape behind.